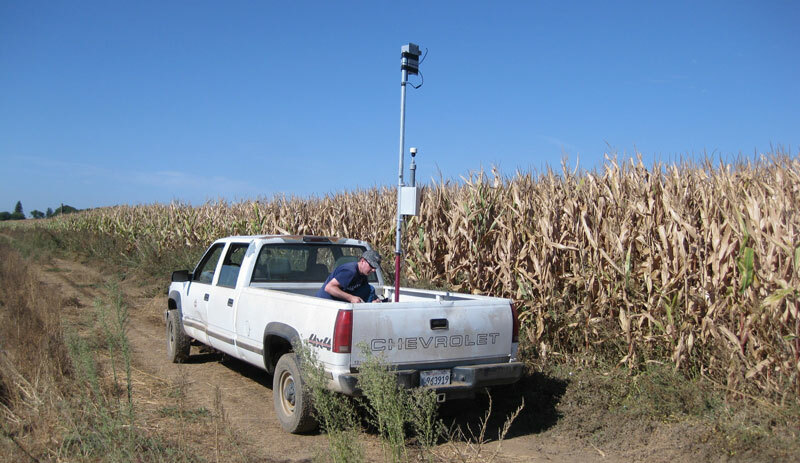 In the autumn of 2010, Dr. Mayor and the CSU Chico Atmospheric Lidar Research Group began a collaboration with Dr. Andreas Held, Universität Bayreuth, Germany, to compare in situ measurements of aerosols with the REAL's lidar backscatter intensity signal. Initial funding for the collaboration is being provided by Bavaria California Technology Center (BaCaTeC). With funding from BaCaTeC, Dr. Mayor visited Bayreuth in the fall of 2010 and Dr. Held visited Chico in the spring of 2011 with graduate student Theresa Seith. During these visits, the team examined lidar and particle counter data collected during the CHATS field experiment. We concluded that the lidar beam and the sampler inlet were not close enough in space to make a meaningful comparison. In September of 2011, Dr. Held returned to Chico with Compact Lightweight Aerosol Spectrometer Probes (CLASPs) developed at the University of Leeds. These counters are capable of resolving the aerosol particle size distribution into 16 size bins with 10 Hz sampling. The team directed the lidar beam as close to the sampler's insets as possible between 1 and 1.5 km range without causing a hard-target reflection. With support from NSF AGS and NCAR EOL, Mr. Bruce Morley, supported the project by preparing and operating the REAL. Mr. Patrick Ponsardin from Albuquerque NM also visited during the experiment and assisted with optimization of the lidar and data collection. CSU Chico physics and computer science major Chris Hasek processed the stare data and made it available by web. Below: Dr. Held deploys a CLASP at the CSU Chico University Farm on 30 Sept. 2011. Below: Group photo. From left to right: Theresa Seith, Forest Sears, Jen Lowe, Chris Mauzey, Andreas Held, Shane Mayor.